Amphenol RF’s SMP Connector Series » Electronic Salesmasters Inc. 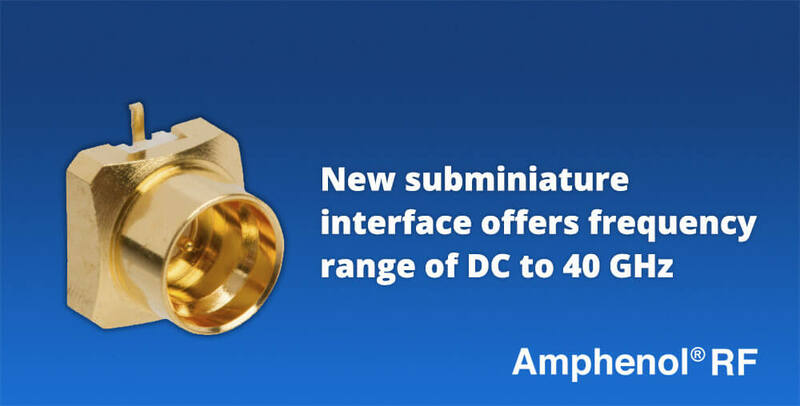 The SMP interface is a subminiature interface in the same scale as MMCX connectors but offers a frequency range of DC to 40 GHz. The SMP interface is commonly used in miniaturized high frequency coaxial modules and is offered in both push-on and snap-on mating styles. The available systems, full and limited, provide respective levels of engagement/disengagement forces. This family of interconnects addresses all package design needs. It can be utilized as a highly shielded interconnect for high data rate applications or in a board-to-board system using a floating bullet. This floating bullet provides a link between mated pairs compensating for both radial and axial misalignment. Available in a cable-to-board mated pair, the plug side can be provided in either right angle or straight with termination capability to either 0.047” or 0.086”, semi-rigid or conformable coax. The receptacles are designed for surface, through hole, or end launch mounting. We are honored to serve as a manufacturer’s rep for Amphenol® RF, the world’s largest manufacturer of coaxial connectors for use in radio frequency, microwave, and data transmission system applications.